Hello and welcome to my blog!! I am 13 years old and I love blythe dolls, animals (particularly frogs, owls and deer) Harry Potter, drawing, writing and all things crafty. I have three blythe dolls: Evie (simply chocolate) Scarlett (urban cowgirl) and Daphne (simply mango). they are AWESOME!! This is my dog Jelly. I also have lizards, frogs and budgies. 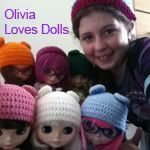 On my blog I will be posting about blythe dolls, my pets, craft, my friends and lots of awesome things like that!